Chloramine is becoming more common as an alternative to chlorine for water treatment and must be treated differently. Treating with standard carbon blocks can result in the addition of ammonia and other compounds harmful to an aquarium. The Pentek ChlorPlus Carbon Block promotes additional reactions which result in water safe for fish and corals. If you are unsure if your city uses chloramines call your city hall or water treatment center and ask for a water quality report. *Nominal rating will remove >85% of particulate of given size from water with single pass filtration. Chloramines are different that chlorine which is used by most municipalities to treat the city water supply. Chloramines are chlorine reacted with ammonia to create a more stable disinfectant. At least 10% of the nation’s water supplies now treat their water with chloramines. To find out if your city is one of them, call your city water supply and ask them directly or ask for a water quality report. To find the number for your water treatment facility check your water bill or call city hall. 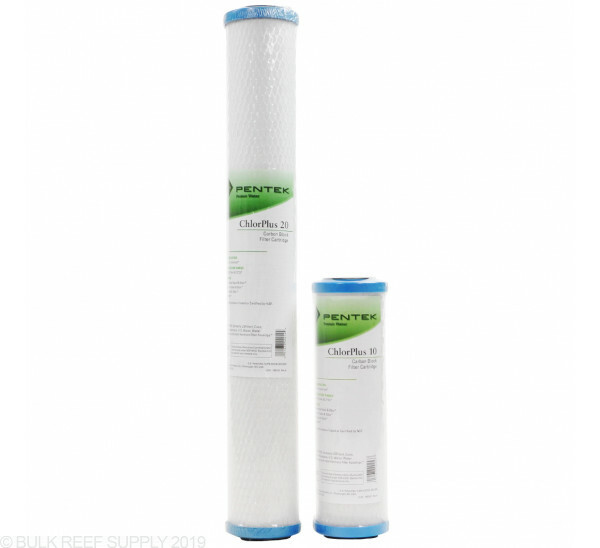 Note: With advancements made in filter technology we now supply BRS Universal Carbon Blocks and include them on all of our BRS Universal RODI Systems which we would recommend for chloramine filtration over the ChlorPlus Carbon Blocks. If you wish to upgrade your current system to utilize BRS Universal Blocks you can easily change out the catalyic carbon, and ChlorPlus filters for Universal filters. I wanted to reduce the level of chloramines reaching my di resin and this is a great way to accomplish the goal. I noticed my di resin last a lot longer with this carbon block . It's diffently decrease my resin use. I replaced the OEM block in my filter with one of these. Without the DI resin, I could still taste chlorine at the same level as the original carbon filter. Granted, I'm in SoCal with lots of chlorine and chloramine, but I was hoping for more. Now, having run 100 or so gallons of produced water, I'm burning through DI at about the same rate. At least in my environment, it wasn't worth the price premium. Great video on how Chloramine's are not removed from my 4 stage RO/DI. 5th stage was easy to hook up. CS was helpful on what was needed. This works well, but I suggest using it with activated catalytic carbon. Really removes the chloramines. I purchased an RODI system and it came with regular carbon filters. Well I didn't know very much about this, but my system went to the fishes in about 2 months with only 300 Gallons used, and TDS was running at around 26. I then did more research and found out my area uses Chloramines, and it pretty much killed all the filters I had on my system. I then repurchased all filters from BRS and everything is working like a charm. These filters did the job and hope that it last me more than a few months this time around! I've been using these for years and love that BRS carries them. Alot of water companies are using Chloramines now, and if they are, you need to be removing it from your water. This is as good as it gets for removal as far as i'm concerned. A number of cities are starting to use Chloramine. Chloramine is becoming more common as an alternative to chlorine for water treatment and must be treated differently. Your ciity can switch over without leting you know. Chloramine left untreated can cause alge blooms in your tanks. I started making my own water about a year ago and since have had some algea issues. I've tried everything under the sun to correct it. Then I started researching Chloramines (after seeing a BRS video on it) and the affect it has on a reef tank. Thinking this might be my problem I called my county water supply and sure enough they use Chloramines in our water. I added this as an additional stage to my already 4 stage RO/DI unit (which made it a 5 stage now). I have already noticed that I don't get the algae breakout after top offs. So with time I hope this will rid my algae problem. Thanks Bulk Reef you opened my eyes to Chloramines. That was a great investment and if my fish could talk, they would probably thanks me!!! I have your 5 stage chloramine plus RO/DI system. It's time for new filters, was wondering if using 2- chlorplus carbon blocks instead of GAC and chlorplus works any better? 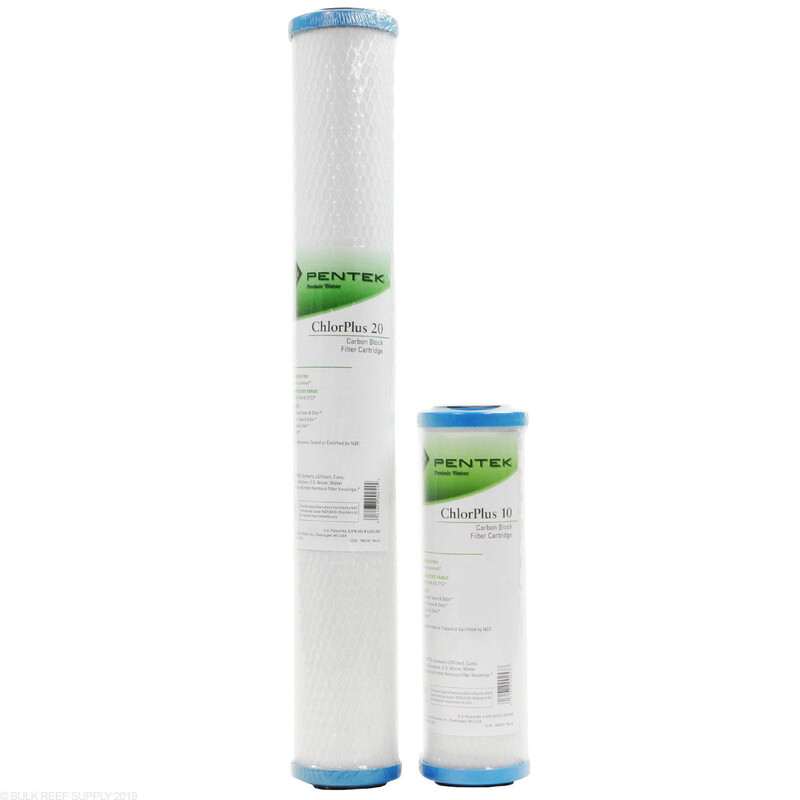 If you already have the chloramines system you would be better served by the existing filters which are more effective and less expensive. The two chlorplus block concept would is meant to be an option for folks who don't have a carbon rinse valve that simplifies the rinsing of the catalytic carbon. Can I just use the ChlorPlus Carbon Block or do I need to have the Catalytic Activated Carbon first. You would want both. The catalytic carbon is actually the filter that does the majority of the chloramine removal when they are paired up.